The following 3 videos will teach you how to breakdance step by step. We recommend that you watch these lessons in order as they are arranged from easiest to hardest. These moves come directly from our breakdancing courses which you should check out if you want to learn more. A word of caution, you must be careful when you attempt these moves. Be sure to study the movements very carefully and slowly and then ease into them. For other online dance classes click here. 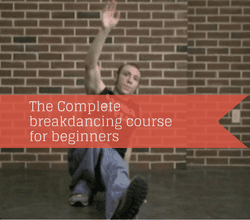 The 3 step is one of the most popular beginner break dance moves. It consist of 3 steps that are done in a circle. In this move you will start with one leg extended in front of you and then will switch the legs as fast as you can so that the other leg is extended, from there you bring the leg side where you end up in a kind of push up position. Learn how to sync the arm switches with your leg switches. Learn simple but impressive moves step by step! You will learn footwork moves, ground moves as well as freezes. This video course has 3 modules with +3 hours of video instruction. Delivered through instant online access. This is another cool bboy move. The corkscrew up is perfect for when you need to get up from the ground in a “cool” and smooth way. You can do this move on it’s own or from any other combination of moves.Here you will develop strength and balance as you push off the floor to spin upwards and around. One more to go below! Learn how to do a baby freeze move in this video. Freezes in Breakdancing are meant to draw attention to the dancer and are usually put in at the end of some footwork combination like the 3-step above! The baby freeze is great to start out with since its small. It still requires lots of coordination and practice so take it slowly and make sure you don’t skip anything. Breakdancing was founded by the black community and Puerto Rican kids in the 1970s. And it really became popular after James brown’s single “Get On The Good Foot” where his busted out his high energy footwork dancing. After that, the kids in New york started to copy his moves and eventually it evolved to be called b-boy or break dancing. At that time most of the style was ground footwork combinations without any of the fancy stuff you see today like windmills or back spins that are popular today. There were also breakdancing battles between gangs or clicks. Another dance called “uprock” influenced the b-boy dancers. In this dance style, the dancers mimic fighting moves into rhythmic dance moves that opponents would use to ‘battle’ against one another. The music is not restricted to Hip Hop anymore. These days dancers choose Techno, Jazz, electronic, pop and an other types of music that suites their style.